Happy Wednesday everyone! I am so happy to be back to blogging, I have had the itch all week and it has been so strange to not be posting daily per usual. I have posts scheduled for the rest of the week and I am very excited to share them with you. My little break was wonderful but I am glad to be back (and with loads of new makeup goodies too). I have expressed my love of the giant Walgreens in Chinatown before and while in Richmond over the weekend I was able to hit up my all-time favorite spot Ulta. There isn't an Ulta in DC which is very sad and very good at the same time (my bank account is thankful there isn't one.) Check out below for a list of the products I scooped up. 1. Real Technique brushes: I grabbed the "Expert Face Brush" and a new eyeshadow brush. I have been totally loving the two I already own and was happy to find some new ones on the shelf. Those brushes fly out of the store so I grab them when I can. 2. NYX Chubby Stick Eyeliner in Black Bean: I have heard many good things about NYX (which you can grab at Ulta) and thought this chubby liner would be a fun addition. As most of you know I'm all about a dramatic dark eye and this little guy definitely delivers. It's great for lining my lower lashes or switching it up from my usual cat-eye look. 3. Pur Eyeshadow in Olivenite: Okay, so this one is a little less "drugstore" and a little more specialty. You can find it bigger Walgreens and it's very comparable to MAC in both price and pigment. Walgreens had a sale going on their "mid-grade" makeup products so I scooped this up. I'm loving it for my crease line (since it's matte) and to fill in my brows a little. 4. Maybelline Fit Me concealer and foundation: I'm continuously on the search for new foundations and I'm currently really liking this Maybelline one. It works well with it's concealer counterpart which I have used since college. Its a great concealer and a little bit of a highlighter since it is just a hare lighter than my skin tone. 5. Ardell False Lashes in 330 Black: So one of the few times I've wore fake lashes was at New Years this past year. They were so fun and I found these in Ulta for only like three or four dollars so I thought I'd give them a go. I'm saving them for my birthday weekend. 6. Maybelline Falsie's Mascara: I've been a tried and true Benefit They're Real fan for ages and I must say the waterproof Falsie's is a close second. It is definitely the much less expensive dupe for They're Real. 7. Gosh Volume Lip Shine Lipgloss: Like the Pur eyeshadow this is also a Walgreens mid-range find that I scooped up on sale. I didn't realize until I began searching that this company is UK based (surprise, surprise - everything I'm loving recently is). However, you can snag it at Walgreens in some locations. If any of you know more about the brand please let me know in the comments below! Okay...I'm done buying makeup for a while - ha we will see how long that lasts. Someone seriously needs to never let me into a drugstore or Sephora again! What all have you been currently loving? ps : You can download the script type I used HERE. NIce purchases! I need to try that lipgloss. I need to pick up some of those brushes! Do they work pretty well? 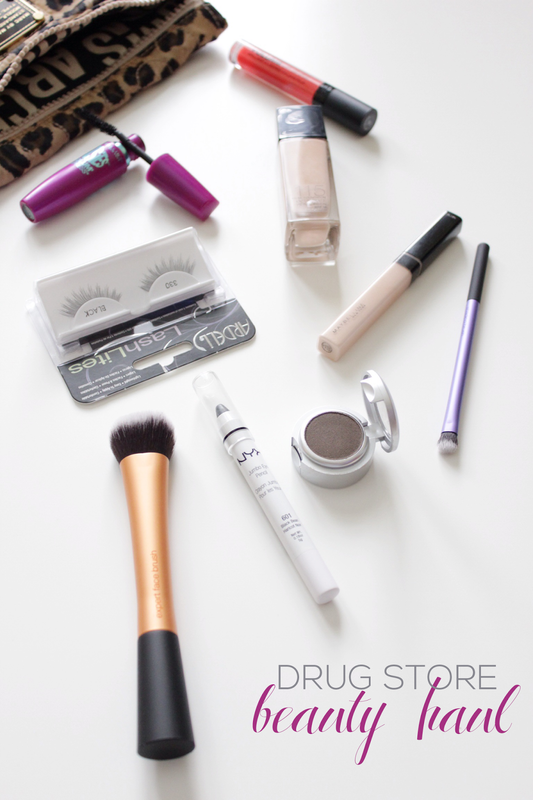 Thanks for sharing these good beauty buys. & the lip gloss + chubby stick eye stick look like fun.